Sources tell CBC News U.S. President Barack Obama brought the idea of an air war conducted by an international coalition to Prime Minister Stephen Harper in August and asked for Canada 's support. Harper agreed to send military advisers to Iraq to scope out what Canada could offer. Canada has deployed 69 special forces advisers in Iraq to date. Analysis | Is ISIS violence expanding worldwide? The United Kingdom, France, the Netherlands and Arab countries in the meantime offered to send fighter jets. 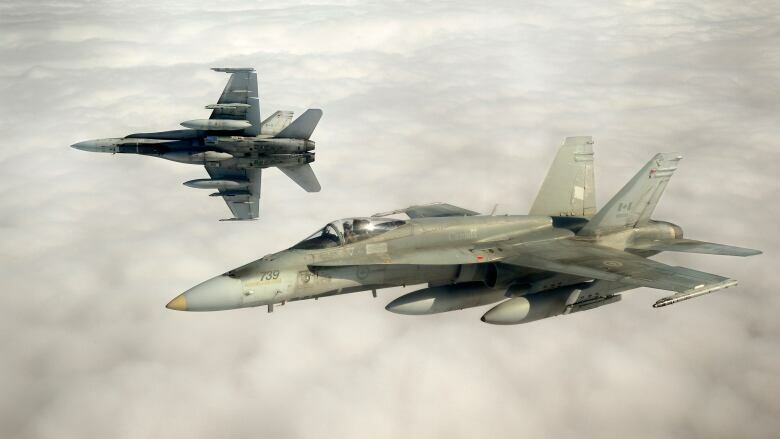 With those commitments in mind and with information from Canada's advisers on the ground, Harper decided to take the option of sending CF-18s to his cabinet. Obama called on nations to support the American-led coalition at the United Nations General Assembly on Wednesday. "There can be no reasoning, no negotiation, with this brand of evil," he said. Canada, along with several European and Middle Eastern countries, has joined the coalition. But only the U.S., Saudi Arabia, Bahrain, Jordan, Qatar and the United Arab Emirates have participated in airstrikes against ISIS targets in Syria. France has participated in some airstrikes in Iraq, and MPs in the U.K. are set to vote Friday about the possibility of assisting with airstrikes against ISIS targets in Iraq — but not Syria.